Honestly YA: Ten authors, One love. 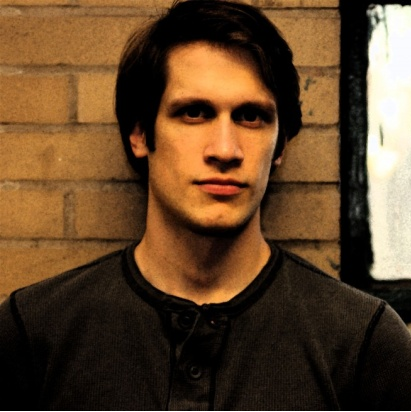 : Welcome Wednesday: Hello, Dan Krokos! Two weeks ago, thirteen-year-old Mason Stark and seventeen of his fellow cadets from the Academy for Earth Space Command boarded the SS Egypt. The trip was supposed to be a short routine voyage to log their required spacetime for summer quarter. With the captain and crew dead, injured, or taken prisoner, Mason and the cadets are all that’s left to warn the ESC. And soon they find out exactly why the Tremist chose this ship to attack: theEgypt is carrying a weapon that could change the war forever. Today's Welcome Wednesday guest, Dan Krokos, is one of the few male authors writing in YA today. And if you've read FALSE MEMORY, you'll know why -- and you'll have read an amazing book. If you haven't read it, what's keeping you? 1. We start simply: What book spoke to you most during your teen years? I didn’t read during my teen years, sadly. I was too busy playing Xbox. I read a lot when I was younger—Animorphs and Goosebumps and Michael Crichton—but I didn’t get back into reading until I was 19, when my friend handed me a copy of Dragons of Autumn Twilight. Just Beat the Reaper by Josh Bazell. I’ve read it four times. There are too many books to read though, so I don’t usually read things twice. I watch too many movies more than once, though. Couldn’t list them all if I tried. Recently? Nothing comes to mind. I’m a slow reader. I’m still on the fifth Song of Ice and Fire book. I want people to read those. 4. (Anyone else getting an image of Mr. Krokos nodding emphatically about Song of Ice and Fire? *s*) So, how have those earlier book-loving or movie-loving years impacted your decisions as an author? In other words, did love of those stories make you want to write teen fiction? Absolutely. The books I write are the books I wanted as a kid. When I did read a book during my teen years, it had to be something that really kept me interested. I don’t want 2 pages of weather, you know? Unless it’s GRRM describing the weather. 5. You’ve got two pretty exciting things going on right now. Your YA novel FALSE MEMORY has been nominated for International Thriller Writers 2013 Thriller Award for BEST YOUNG ADULT NOVEL of 2013 and you’re Middle Grade novel THE PLANET THIEVES releases May 21. Which are you more jazzed about and why? Definitely Planet Thieves. It is a book very close to my heart and I can’t wait to share it with people. The award is of course an extreme honor, but the chances of actually winning are low, so I’m not thinking about it too much. 6. Stick with me for the following analogy, okay? Reading FALSE MEMORY for me was like riding Roc kin’ Roller coaster - both the coaster and your novel go from zero to sixty in a matter of seconds and send you off on a thrill ride. What ride is THE PLANET THIEVES most like? First of all, thank you for reading! Second of all, The Planet Thieves is even more of a roller coaster. I wrote it almost 18 months after False Memory, so I had a lot of time to grow as a writer. The whole novel basically takes place in one day, and A LOT of things happen. Once it starts, it doesn’t stop. 7. Stories that take place in one day are pretty much auto-buys for me, so I'm extra excited now! That said, THE PLANET THIEVES might be categorized by some as science fiction. (Okay, “some” might be only me, and I get that impression by, you know, spaceship references and cover art and aliens and stuff). For our readers who might foolishly shy away from that genre, what would you like them to know about the book that will convince them to give it a read? It is definitely SF, somewhere between Star Trek and Star Wars, but it is first and foremost an adventure novel. I loved stuff like Indiana Jones growing up. I love adventure. It is SF, but I never focus on the SF if it hurts the adventure aspect. 8. Speaking of adventure, in your upcoming novel, the main character, Mason, is called upon to lead a group of his fellow cadets on a series of (mis) adventures that will ultimately save the day from an alien enemy (the Tremist). If you were aboard ship and an enemy were to attack, what would your role be? Would you save the day, like Mason? Or would you lay low (like me)? I would definitely try to save the day, only because doing nothing will ultimately lead to your doom. The enemy has control of the ship, and you have no way to contact reinforcements, so what do you do? Just wait for them to find you? I bet you would only lie low long enough to realize you only have one option: fight. 9. The more I think about this, the more I believe you're right: Fight it is! On a less adventurous topic, tell me, which came first in the writing, FALSE MEMORY or PLANET THIEVES or something else entirely? False Memory was first. It was my first book that wasn’t for adults. Before that I wrote seven other books, all of them for adults. 10. Having read your work, I will selfishly hope to see those adult books soon! Until then, your website says if we want to contact you, we can just turn up at your house. When we get there (with chips and salsa in hand) what will we find you working on? Right now I’m about to start editing an adult book I wrote that we sold the film rights to before we sold the book to a publisher, which is really weird and exciting. I’m also working on a couple of screenplays. But soon begins work on The Planet Thieves 3! Thanks so much, Dan, for being with us today! All right readers, we've all just learned that Dan Krokos can't think of any YA books he's read recently that he would recommend. How about we turn it around a little and suggest some books for him? Let's hear it. What book would you most like your friends to read? Team YA Sci-Fi! Thanks for visiting with us, Dan! Thanks for being with us Dan. You had me at "somewhere between Star Trek and Star Wars." We've got a lot of both going on in my house. THE PLANET THIEVES sounds right up our alley. The YA series I would recommend is DIVERGENT. I'm on the edge of my seat waiting for book 3. My son has been dying for a new series or a "boy book" since he says most of my YA books are "romance crap." :-) I'm so excited to get this book for him! I bought him ENDER'S GAME, but he hasn't read it yet. What books would I recommend? Probably "romance crap." Sorry. But I really loved FAULT IN OUR STARS. That was amazing. My husband loved it as well. And tell him to read Ender's Game! I loved it, but it definitely is slower paced than the planet thieves. 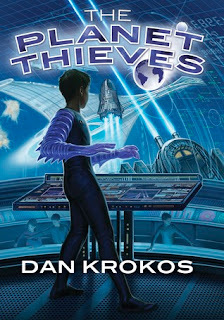 I'm looking forward to reading THE PLANET THIEVES with my two sons. My oldest son read ENDER'S GAME this year and loved it, so this should be right up his alley. Thanks for visiting with us on Honestly YA! Great interview! I am going to pick up both your books immediately! They sound amazing. As for YA books... geez, so many... I'm going to say (even though they are more fantasy than SF): Laini Taylor's DAUGHTER OF SMOKE AND BONE and DAYS OF BLOOD AND STARLIGHT and any of Kristin Cashore's books. ENDER'S GAME is one of my all-time favorite books (I pretty much adore everything by OSC), so if that is slower than THE PLANET THIEVES? I think you've got yourself a new fan.